The Trek truck brings you within a few yards of Animal Kingdom's herbivores. 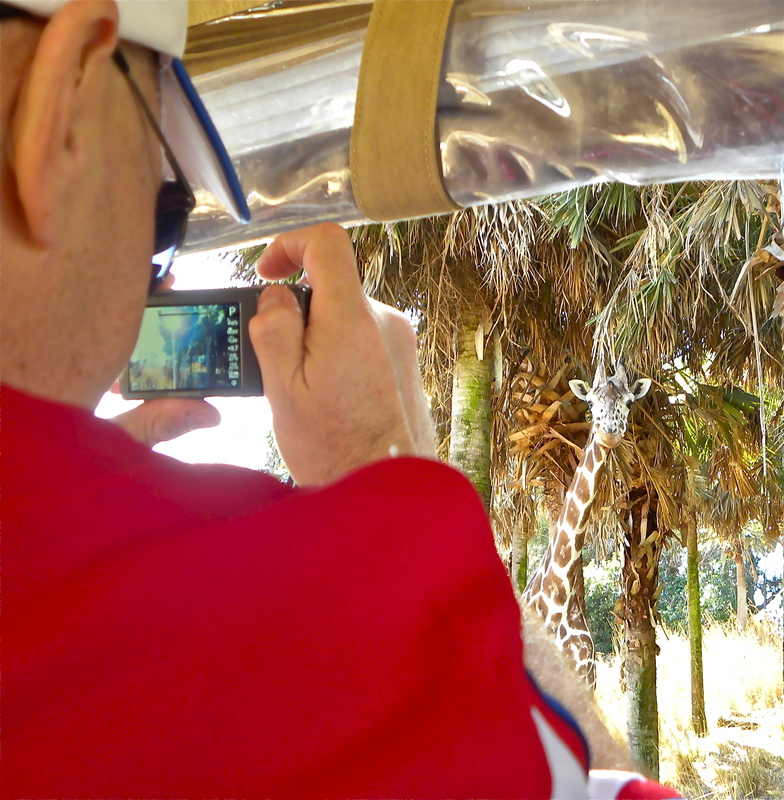 I was thinking the same thing when I went on the park’s new, three-hour experience, the Wild Africa Trek: What took them so long, to provide the customers a more up-close view of the critters? 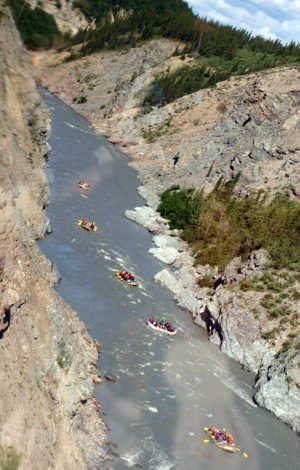 The Trek is pricey — $129 until Feb. 26, then $189 – but it is fun, educational and at times, thrilling. On the two hours of walkabout, you will be leaning over the banks of a river to get within15 feet from hippos and from crocodiles so large they look like leathery minivans with pointy teeth. A lot of teeth. Saving you from becoming someone else’s very special memory of the trek is a snug-fitting vest. It has harnesses around your upper thighs and a sort of industrial-strength bungee cord attached to its back. 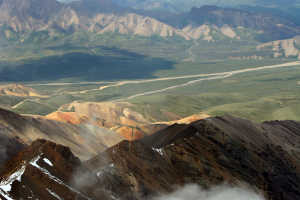 The two Trek guides help you hook a carabiner clamp at the end of this cord to brackets that slide along metal railings. This allows you to lean over the river banks, as well as to cross two swaying suspension bridges. Your snug vest and bungee line keep you tethered when crossing the bridges. The bridges, too, cross the river, and while you grasp the cables that hold up the netted sides of the bridges, you’ll be looking down for the irregularly spaced wooden planks on which to step. Looking down is good, because you’ll again be eyeing the crocs or the hippos, more than 20 feet below. The guides alternate leading/narrating the walk and photographing the participants, limited to a maximum of 12. 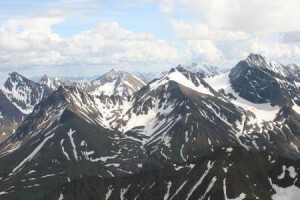 At the end of the trek, each person is given a card with password information that allows them to view all the images taken and to then order a photo CD, which is included in the fee. Also included is a charming picnic lunch served at an observation post providing great views of elephants, giraffes and various types of antelopes. The lunch, served in an ingenious metal container, includes appetizer-sized items such as prosciutto ham, shrimp, salmon and hummus. This lunch stop occurs in the last third of the trek, which is made by open-sided truck. It follows the same roads used by the often-crowded Kilimanjaro Safari trucks. But your truck benches have plenty of space, and binoculars are provided for the frequent stops to better view animals. My truck paused within 15 feet of a young giraffe and an adult, within 30 feet of a rhino and her youngster. We also watched three cheetahs on a nearby hillside, a lion and lioness looking relaxing in the sun, plenty of hooved stock, and several adult elephants and a predictably cute young one. 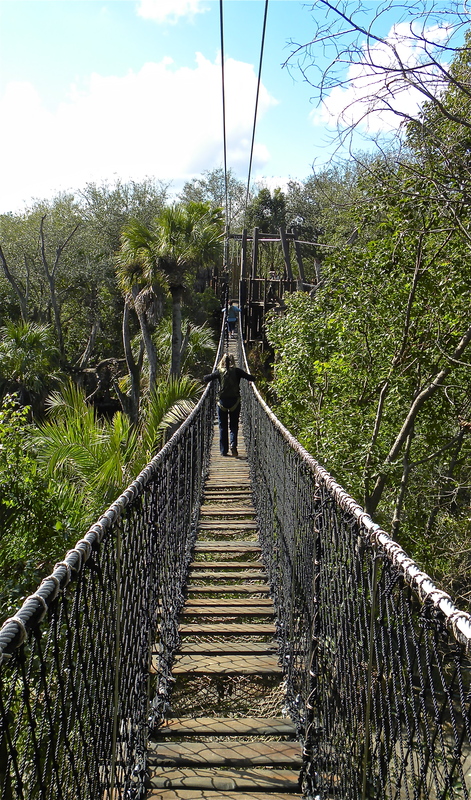 The Wild Africa Trek provides up-close views on a three-hour trip. 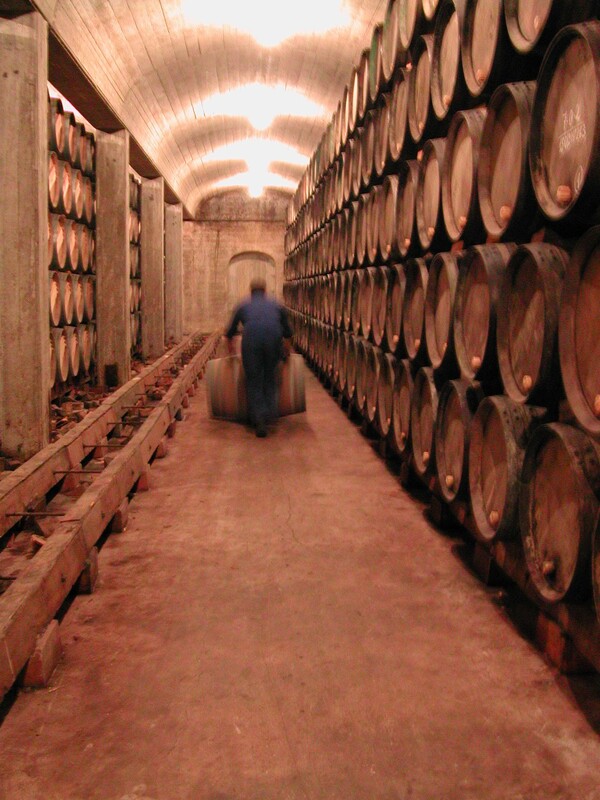 All of these were pointed out and described to us by the knowledgeable guides. We heard them over ear pieces that attached to portable radios receiving their commentary. The Wild Africa Trek offers especially close-up views of creatures we otherwise might never get. 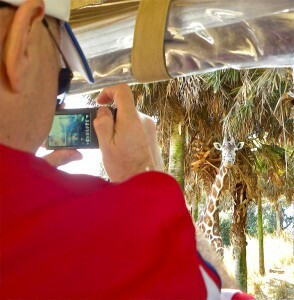 On the Kilimanjaro Safari trucks, you could be in the middle of a row, with other passengers blocking your camera. Not the case on the Trek, and we never left a stopping point until everyone was satisfied with their view through the provided binoculars or their cameras. Because Wild Africa Trek steps off just six times a day and is limited to 12 people, reservations are recommended; call for (407) 939-8687. It is limited to those at least 8 years old and weighing less than 300 pounds – participants step on a scale before they are allowed to don a vest, though the scale’s read-out is seen only by a staffer. Also before being outfitted, each participant must empty their pockets into their own locker, lest anything fall out during the trip. Cameras that have a neck strap can be retained. A ticket to Animal Kingdom is required in addition to the Trek fee, which is $129 through Feb. 26, when it rises to $189. In addition to the walk and truck ride, participants receive lunch, a metal water bottle to keep, and a CD of photos of their experience. BURANO, Italy — A few minutes after stepping off the ferry to this island, you start looking for the people with clipboards, the ones asking your opinion of the brilliant colors into which every house and shop has been dipped. This must be where paint manufacturers challenge the sun to fade their most audacious colors. Wonder what a 40- by 25-foot wall of raspberry looks like? Look at the house over there, between the tangerine and lemon, just across from the chocolate. You want to lick this village. “Boo-RAH-no? Take the big boat, over there,” advises the water-bus ticket-seller near Venice’s famed St. Mark’s Square. He is indicating the two-deck boat that is headed first for the beach island of Lido, then the little-visited island of Torcello, and 70 minutes after the lines are first pulled in, Burano. This Sunday morning the boat is crammed with couples pushing strollers, people carrying fold-up beach chairs, pretty young things and too-cool guys wearing the darkest of shades and bobbing to the beat coming from earbuds plugged into iPods. There are tourists, too, clutching maps and guidebooks. The boat docks at Lido, and almost everyone gets off, but we head toward the sherbet-colored island. “Boo-RAH-no! Boo-RAH-no!” shouts the muscular young deckhand on the boat as it docks. The men living here have broad shoulders and thick forearms from hauling in fishing nets. Their wives and daughters operate tourist shops or embroider or, much less frequently now, make lace. 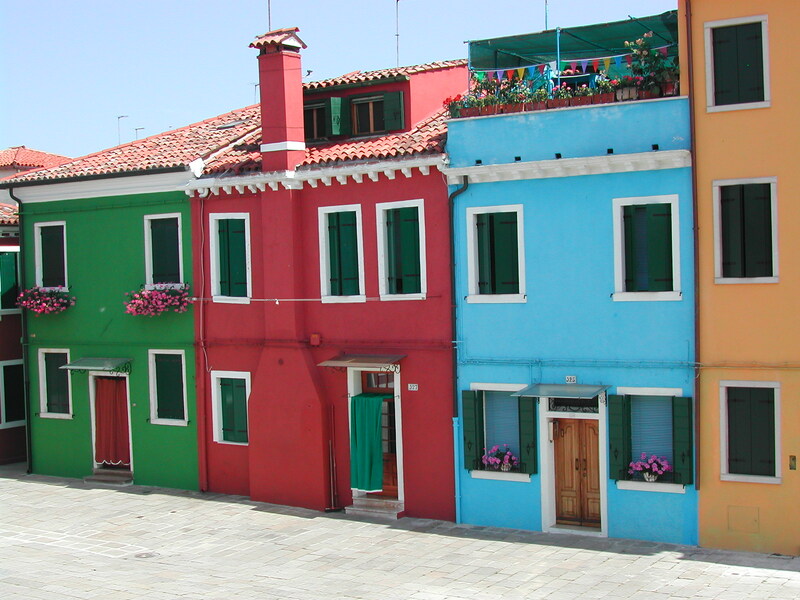 For centuries, Burano has been distinguished by its contrary signatures: loudly colored houses and dainty needlework. 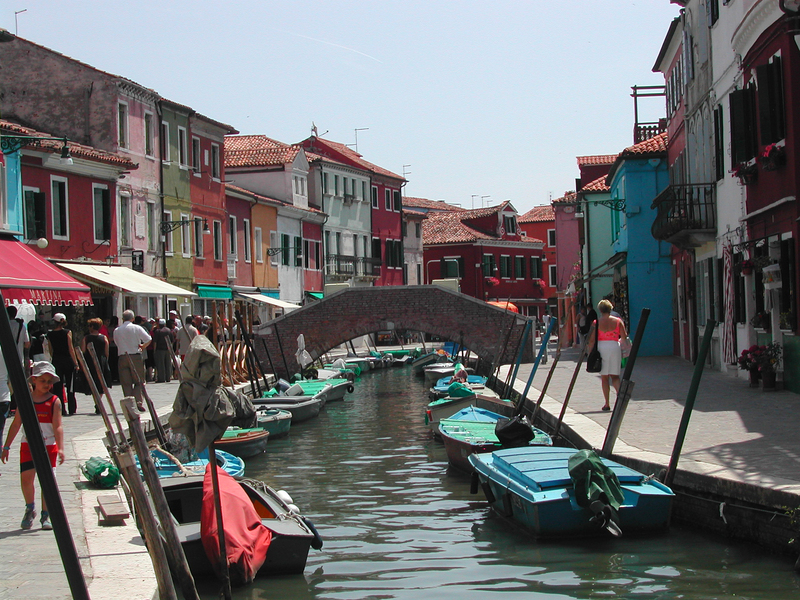 Small fishing boats are tied along one of the narrow canals that criss-cross Burano. The island is all narrow streets, tinier alleys and canals just wide enough to tie up narrow boats on each side. The houses are built in rows, with precious little space for privacy. That’s what caused one resident to reach across the alley this morning and pound a broom handle against the wooden window shutters of a neighbor, protesting the volume of the rap music pouring from that house. Bam bam bam, went the broom handle, without success. Bam BAM BAMMM! However, that is the only jarring note in this ice-cream parlor of a village, as lunchtime arrives. Dozens of residents, and more than a few visitors, set up small tables in the dockside park for picnics. The maitre’d of the well-regarded Al Gatto Nero-Da Ruggero cheerfully turns away would-be customers because the entire canalside restaurant, short blocks from the tourist-filled main square, is reserved for lunch. Reproduced on the menu are the autographs of such customers as Ernest Hemingway (“To Romano, a friend of the arts – too few of them now”), Charlie Chaplin, Nobel laureate Enrico Fermi, Giorgio Armani and Federico Fellini. The shrimp risotto, for about $20, is pretty impressive, too. 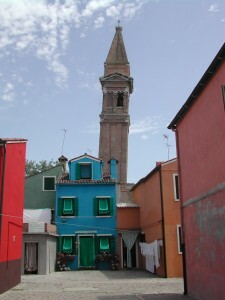 Colorfully painted homes frame the leaning campanile of Burano's main church. Just around the corner from the restaurant, and across the plaza from the old church with its dizzily leaning bell tower, is the Scuola del Merletti. For 98 years, it was the School of the Lacemakers, a government effort to preserve a once-legendary skill and to rejuvenate the island’s sagging economy. In the 16th century, the lace made in and around Venice was so prized throughout Europe, it was known as punta in aria, points (or stitches) in air. But there was much competition to decorate the finery of the well-to-do. And by the early 19th century, machine-made lace and embroidery reduced the area’s share of the market. Handmade lace, exquisite but time-consuming to create, became too expensive to support any sizable number of artisans. In 1872, the government created the school to teach again the graceful art. The school was closed in 1970 and was later converted to a museum. Now, village women demonstrate the work to tourists in the museum, where cases display marvelous pieces of handiwork dating nearly 400 years. A standard linen tablecloth with colored-thread embroidery is about $195; the same cloth with an insert of Burano lacework is about $1,200. And an all-lace tablecloth, which took four groups of women three years to make, is about $7,100. A visit here fills no more than a half day, and then it’s time to catch the ferry. The boat moves slowly from the dock, which is a few hundred yards from the square, the leaning church tower, the lace museum, Da Romano. Visible for several minutes, though, are the houses, painted so many vivid colors: That visibility, the story goes, is to help fishermen spot their homes as they motor in with their catch. 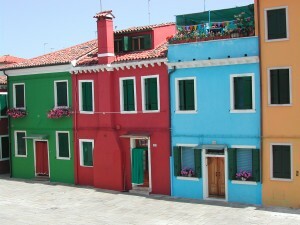 Some less-charitable people, allof them living in glamorous Venice, say the full-palette treatment has been utilized simply to brighten dreary winter days on Burano. Either way, it would seem to work.